What a full and inspired autumn we’re having at Kata Golda. In October's newsletter we announced Kata Golda's new partnership with Creativebug, a growing resource of online craft workshops by notable designers. Kata Golda founder Alison Kaplan recently spent a week at their studio in San Francisco, filming tutorials for new DIY felt sewing projects. One of the videos, a tree advent calendar, is now available for viewing on Creativebug. The other — a fox holiday stocking — will become available later today (11/15/12). 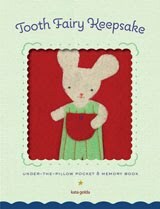 Each is carefully crafted, walking you through step-by-step instructions as Alison demonstrates how to sew each project using felt and thread. As companion pieces to these tutorials, we've put together a materials kit for each project that contains the right amount of soft, wool felt and cotton embroidery floss needed to create the handmade item. The "Fox Stocking" Materials Kit is available for $43.00; the "Tree Advent Calendar" Materials Kit ($52.00) also includes a metal ring from which to hang the calendar. Get a jump on your winter holiday decorating and gift making with these Kata Golda sales and events. Kata Golda and Egg Press will be gathering together once again for our annual holiday/sample sale, hosted at Schoolhouse Electric's Design Library at 2181 NW Nicolai St in Portland. Open to the public from 10am – 6pm on Friday, Saturday and Monday; 11am–4pm on Sunday. 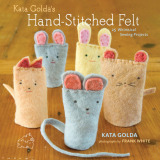 Kata Golda's sale ends Sunday 11/18/12. Gilt provides instant insider access to top designer labels at up to 60% off retail. 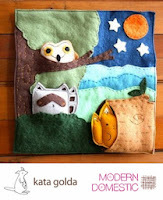 Look for a sale on popular Kata Golda photo albums, banners and tooth fairy pillows starting November 16. Shop early, as supply is limited and is offered on a first-come, first serve basis. This is the only online sale Kata Golda will be doing this holiday season. We'll be adding a whole new selection of designs to the Kata Golda Etsy Boutique on November 20. Look for new holiday-related items such as Christmas stockings, personalized ornaments, and small hand-sewn stocking stuffers. 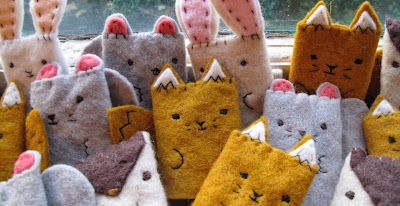 Learn to make a fox stocking and a matching ornament from soft, wool felt. The cozy stocking is adorned with a fox using both hand and machine sewing. The little fox ornament can be enjoyed all year long — hang on your tree, a door knob, or a wall. 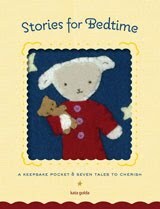 You’ll learn the basics of both hand (running stitch, whip stitch, satin stitch, blanket stitch) and machine stitches. The class fee includes all soft supplies; register online. The Woodlands Wall Hanging you create will be an heirloom piece to cherish. This interactive woodland scene is created using hand stitching and is framed with machine stitching; you'll also create plush felt animals to fit into the hanging's pocket. The class fee includes all soft supplies; register online. Sorcha Ashling, stitcher extraordinaire, felt dyer and owner of OhMa Felt. And thank you, fans and customers of Kata Golda. I wish you a season filled with an abundance of whatever it is that brings you joy. All orders placed by 11/30/12 will arrive by 12/8/12 (the first day of Hanukkah). All orders placed by 12/12/12 will arrive by 12/21/12.